I love a good layered look, especially when it’s really cold out. I like to wear light layers in the office where it gets really warm, but the second I walk out the door my teeth are chattering all over again! 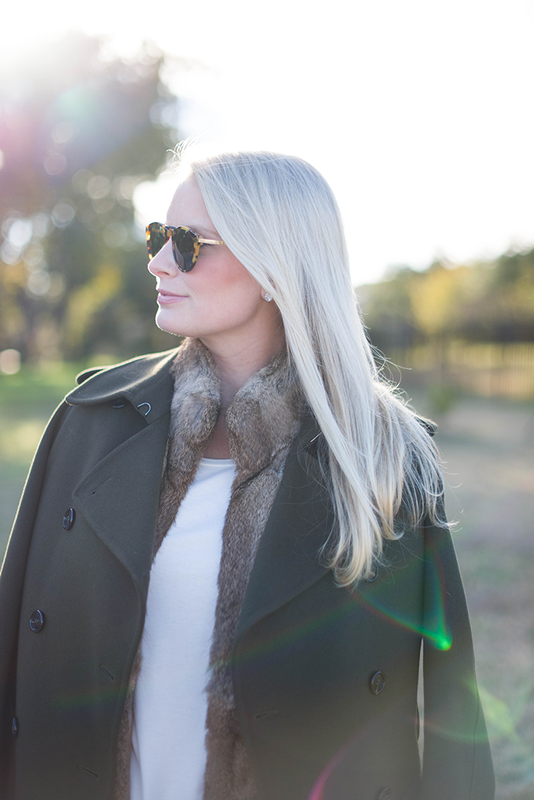 A combination of different layers is usually best – my typical go-to when the temps drop is my fur vest. Worn over a long sleeved top (I can’t stop wearing this one) or light sweater, it keeps me warm and stylish at the office, but worn under a larger coat it adds just the right amount of additional warmth and a bit of texture/depth to the look. 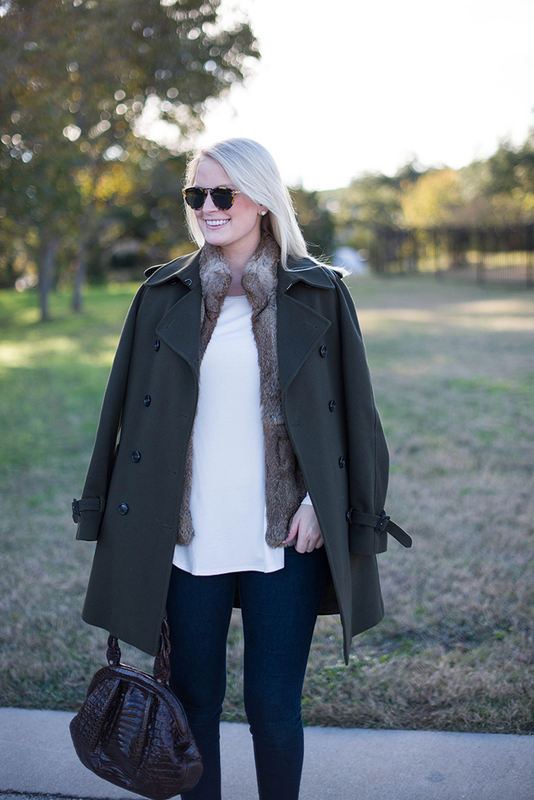 Click here to check out a gorgeous selection of fur vests in all colors and silhouettes! Have you been following along on Instagram lately? I’ve been posting little sneak peeks and teasers for my upcoming Calpyso event this weekend in Austin! Click here for the details and email austin@calypsostbarth.com to RSVP! this is an awesome layered look, love the peep of fur. Love this classic look. Those jeans rock and that fur vest is amazing! Love this layered look and the gorgeous fall colors! Love that shade of green, so flattering on blondes! 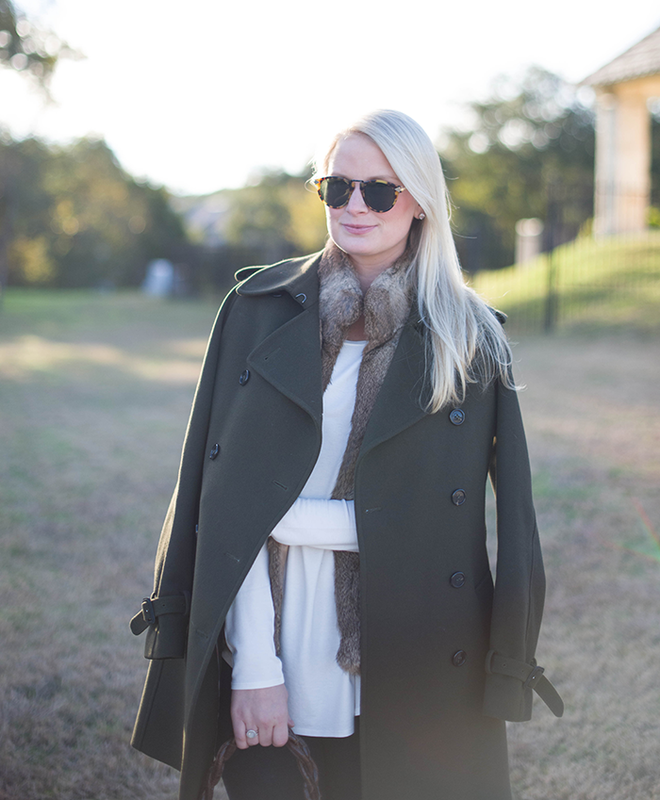 The layered look looks great, but that coat looks far too heavy for Texas. Loooove the colors you’ve mixed here! Love this easy, laid-back, classic look! You are such an inspiration Merritt! Love! 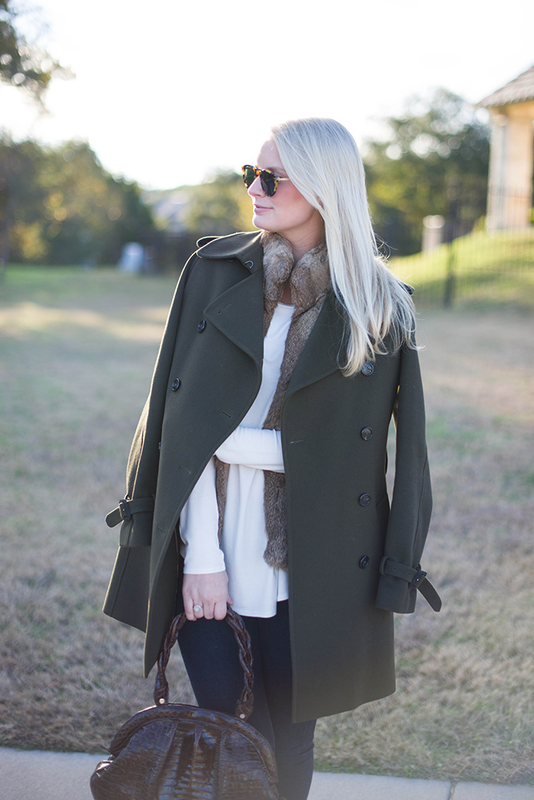 I love the fur with the olive green wool, such a great color and texture combination! 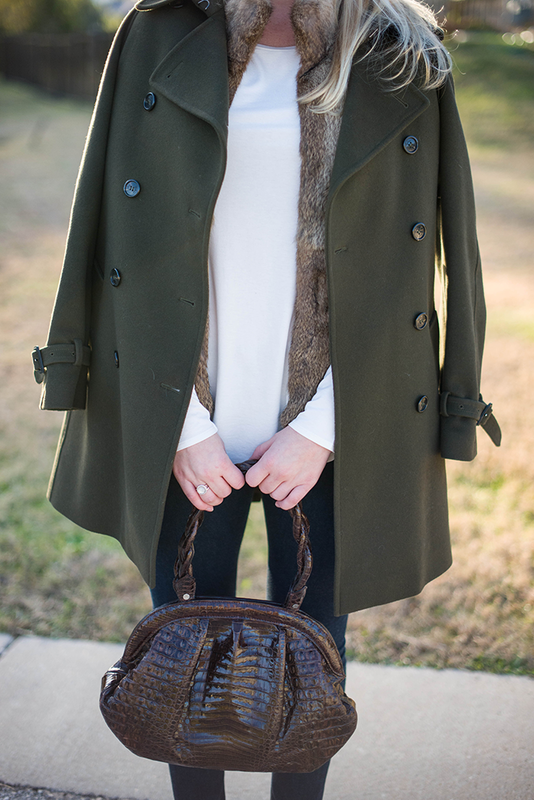 Olive is one of those colors that I’m not sure I can wear, but this is such a great coat! Love your take on layers! Stunning! 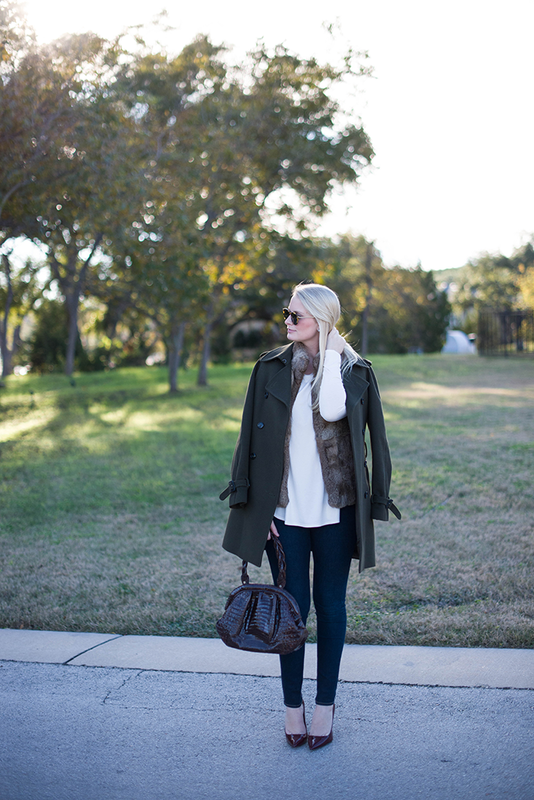 Absolutely love the layering, the perfect simplicity, and this vest and coat. Wish it was cooler here; I’d be totally copying this! gorgeous (as always). definitely one of my favorite looks of yours recently. 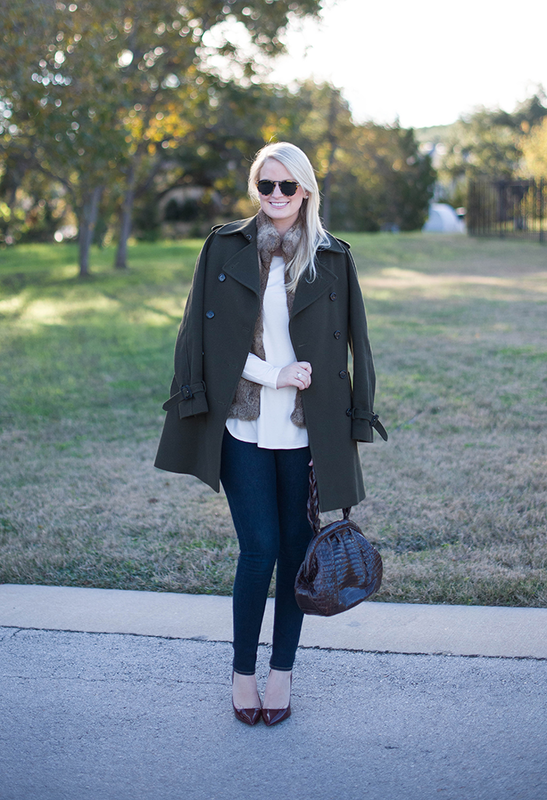 love how you layered a vest under the coat. great idea! Looking lovely, love the colors. Neutral and clean! Happy Hump Day! Gorgeous! I own the same coat and LOVE it. The color is such a great substitute to the usual black. This is a well layered look! I love the olive jacket over the fur vest, you look warm and comfortable. This is perfect! 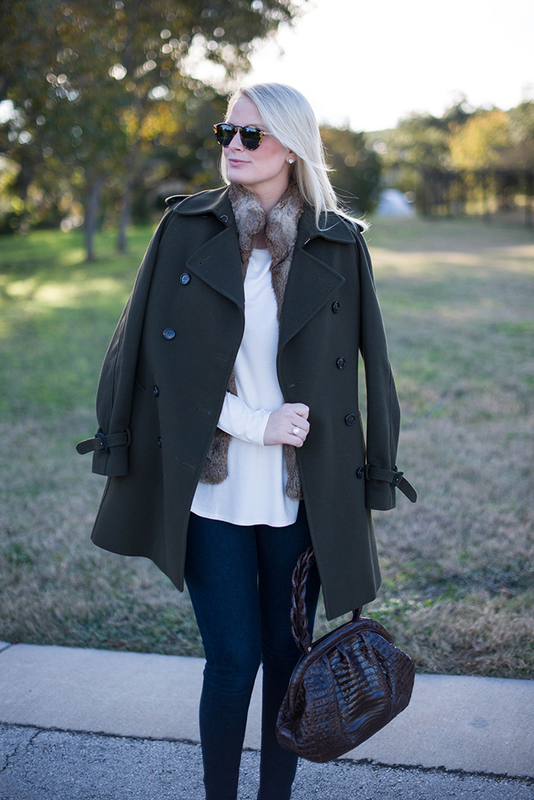 I love that combo of the fur vest and olive coat!! Such a great layered look! I like how you layered the cost with fur. The perfect combination! This is layering perfection. I love it!! So beautiful. Love that green color and I’m usually not a fan but it’s so beautiful on you!